X Es wächst an trockenen Orten mit wenig Niederschlag. Nur einmal im Jahr bildet es eine gelbe Blüte. X Cacnea vit dans les zones arides. Une fois par an, une fleur jaune éclot sur sa tête. X Vive en regiones secas y con pocas lluvias. Una vez al año, le brota una flor amarilla. X Cacnea vive in zone aride, dove non piove quasi mai. Il suo fiore giallo sboccia una volta all’anno. X 비가 적은 건조한 지역에 서식한다. 1년에 1번 노랑 꽃을 피운다. Y Es bevorzugt lebenswidrige Gebiete wie Wüsten. Der Wasserspeicher in seinem Körper reicht für bis zu 30 Tage. Y Il se sent plus à l’aise dans des endroits hostiles comme le désert. Il peut survivre 30 jours en utilisant seulement l’eau stockée dans son corps. Y Prefiere los medios hostiles como los desiertos. Puede sobrevivir 30 días sin beber, gracias al agua que almacena. Y Predilige ambienti ostili, come i deserti. Grazie all’acqua immagazzinata nel corpo, può resistere 30 giorni senza bere. Y 사막 같은 혹독한 환경을 좋아한다. 몸속에 축적된 물로 30일간 살 수 있다. Omega Ruby The more arid and harsh the environment, the more pretty and fragrant a flower Cacnea grows. This Pokémon battles by wildly swinging its thorny arms. Omega Ruby Je trockener und trostloser seine Umgebung ist, desto schöner und duftender wird Tuskas Blume. Dieses Pokémon schwingt im Kampf wild mit seinen dornigen Armen. Omega Ruby Si son environnement est aride et difficile, la fleur de Cacnea devient plus jolie et dégage un parfum délicat. Ce Pokémon se bat en agitant ses bras épineux. Omega Ruby Cuanto más árido y hostil sea el hábitat de Cacnea, más bonita y aromática será la flor que le crece. Este Pokémon lucha agitando violentamente los brazos cargados de pinchos que tiene. Omega Ruby Quanto più arido e aspro è l’ambiente, tanto più rigoglioso cresce il fiore di Cacnea. Il Pokémon lotta agitando furiosamente gli spinosi arti superiori. Omega Ruby 비가 적은 척박한 환경일수록 아름답고 향기가 강한 꽃을 피운다. 가시가 달린 팔을 휘두르며 싸운다. 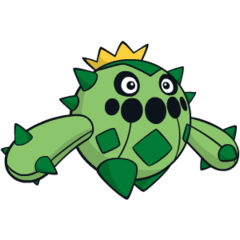 Alpha Sapphire Cacnea lives in arid locations such as deserts. It releases a strong aroma from its flower to attract prey. When prey comes near, this Pokémon shoots sharp thorns from its body to bring the victim down. Alpha Sapphire Tuska lebt an trockenen Orten, z. B. in Wüsten. Es versprüht einen starken Duft aus seiner Blume, um Beute anzuziehen. Wenn sich Beute nähert, verschießt es scharfe Stacheln, um seinen Gegner zu überwältigen. 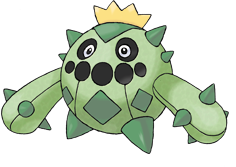 Alpha Sapphire Cacnea vit dans les milieux arides, tels les déserts. Sa fleur libère un parfum entêtant pour attirer sa proie. Lorsqu’elle s’approche, ce Pokémon envoie des épines pour la neutraliser. Alpha Sapphire Cacnea habita en desiertos y otras zonas áridas. Para atraer a su presa, libera un fuerte aroma por la flor y, cuando se le acerca, le lanza pinchos por todo el cuerpo para reducirla. Alpha Sapphire Cacnea vive in luoghi molto aridi come il deserto. Il suo fiore rilascia un forte aroma per attirare le prede. Quando la preda si avvicina, il Pokémon le spara contro un nugolo di spine del proprio corpo per abbatterla. Alpha Sapphire 사막같이 건조한 지역에 서식한다. 강한 꽃의 향기로 먹이를 유인하고 몸에 난 날카로운 가시를 날려 잡는다. Ruby Cacnea lives in arid locations such as deserts. It releases a strong aroma from its flower to attract prey. When prey comes near, this Pokemon shoots sharp thorns from its body to bring the victim down. Sapphire The more arid and harsh the environment, the more pretty and fragrant a flower CACNEA grows. This POKeMON battles by wildly swinging its thorny arms. LeafGreen It prefers harsh environments such as deserts. It can survive for 30 days on water stored in its body. Diamond By storing water in its body, this desert dweller can survive for 30 days without water. Pearl By storing water in its body, this desert dweller can survive for 30 days without water. Platinum By storing water in its body, this desert dweller can survive for 30 days without water. SoulSilver It lives in arid locations. Its yellow flowers bloom once a year. Black By storing water in its body, this desert dweller can survive for 30 days without water. White By storing water in its body, this desert dweller can survive for 30 days without water. White 2 By storing water in its body, this desert dweller can survive for 30 days without water.